Recently I was introduced to publisher, Phaidon, which has its headquarters in New York and London. It has a huge list of creative arts titles, and many exciting children’s books. Earlier this month, I reviewed the first Phaidon book, Undercover, in my list of Books, Apps and Gift Ideas for Kids and Other People, 2016. I loved the minimalist text in this charming children’s picture book. It just begs to be read aloud in a deadpan voice, but with lots of meaningful pauses and plenty of room for eyebrow lifts! The narrative arc is reminiscent of the game “Fortunately…Unfortunately”, with twists and turns as we see little Toto’s creative problem solving lead to even more problems. The simple text also means that Toto’s Apple will make a great choice for beginning readers. I know children 2+ will respond enthusiastically to both the vivid artwork and the playful text. Hug This Book! won my heart instantly. I adore the idea of a book that invites kids to share the love that books and reading can bring. Don’t we all know youngsters who obsess over a certain book and want it read aloud every night? Hug This Book! is written in an energetic and rhythmic way that has kids giggling from the get-go. Benaglia’s illustrations are reminiscent of comic book art, with lots of enthusiastic splotches of colour and flowing ink sketches that add even more energy and fun to each page. Below is a wonderful trailer for Hug This Book! It turns the text into a song, showing just how well the rhythm and rhyme make it flow as a read-aloud. Do seek out this charming children’s picture book for your collection! This glorious treasury brings together eight iconic tales by Tomi Ungerer, featuring well-known classics (The Three Robbers, Moon Man, Otto), acclaimed recent works (Fog Island), and lost gems (Zeralda's Ogre, Flix, The Hat, and Emile), some of which are being published for the first time in 50 years! Special features include a personal letter from Tomi, new quotes and anecdotes about each story, an exclusive interview, photos and previously unpublished materials from the making of some of his most celebrated works, such as storyboards, sketches, photographs, and images that inspired him. If you’d like your kids to meet the iconic Tomi Ungerer, and you can’t make it to the Tomi Ungerer Museum in Strasbourg, this would be doing it in style! 320 pages of hardcover book means it’s not light bedtime reading, but what a wonderful keepsake it would make for the whole family! “The book includes never-before-seen content: an introductory letter, anecdotes and quotes throughout from Tomi himself, an exclusive interview with photographs, sketches, storyboards, and other behind-the-scenes material.” Ungerer influenced names like Sendak, Carle and Silverstein, but it's his influence on children that matters to me. Both his art work and prose give you pause for thought and may well influence further generations to create - what a legacy! A little boy imagines the journeys that he and his father go on together; a little girl speculates about her mother's life before she became a mom; an older brother thinks back to when he was the baby; and sisters attempt to halve and share everything in their path. Each humorously narrated story is as messy, unpredictable, and endearing as everyday life with a child! This is a set of books aimed specifically at toddlers and babies. There are four books in the set: Exploring, Imagining, Growing, and Sharing. Each one shows some aspect of family life, with minimal text and large clear and colourful illustrations. Gomi’s art work is unusual and very appealing. Henri Matisse's abstract cut-outs are used to teach colours in this polished read-aloud board book. Blue and Other colours takes children through Matisse's colour palette, one artwork per page, beginning with blue and returning to it as a familiar refrain throughout. The variance of shapes, depth, and scale will keep readers engaged, while the text enriches the reading experience with relatable and humorous commentary. Readers will not only learn their colours, but also grow familiar with fine art in this relevant and relatable first title in this series of concept books featuring the most innovative and influential artists. Includes a read-aloud "about the artist" at the end. Matisse’s art work is, I believe, highly accessible to children because of its emphasis on bright colours and simple design. Even children who have not learned to walk, will grasp the strong, glossy boards/pages in their chubby and focus on the colourful shapes, reinforced by someone’s voice reading aloud the simple text. Great for libraries! Squares and Other Shapes: with Josef Albers by Phaidon Editors (2016.) RRP: $Au14.95. An introduction to shapes through the acclaimed art of Josef Albers. The influential art of Josef Albers is used to teach shapes in this stylish read-aloud board book, which takes children through Albers' range of geometrics, one artwork per page, beginning with squares and returning to them as a familiar refrain throughout. The variance of colour, scale, and quantity adds to the richness of the visual arc, and the accompanying text provides a humorous and engaging commentary. Here’s the second book in the series that began with Blue and Other Colours, reviewed just above. Parents and librarians who are keen to introduce kids to elements of art will also embrace this robust board book aimed at kids 1+. Apart from being a beautiful and visually appealing book, it introduces kids to shapes and colours as used by Albers in his art work. Pancakes: An Interactive Recipe Book by Lotta Nieminen, published by Phaidon (2016.) RRP: $Au19.95. Here’s a novelty book that encourages kids to interact with it by pouring flour, whisking ingredients, ladling batter and flipping pancakes, all via cunningly designed tabs and clever book construction. This is the first in a series of interactive recipe books from Phaidon, and sure to be a hit with young Master Chefs everywhere. An ideal follow up would be to use the recipe and suggestions to make your own pancakes after reading. It seems to be a very strong and durable book, but particularly because one pancake can actually be wholly removed to manipulate, I think it would be best kept for a special non-borrowing section of the library, or of course for respectful home use. 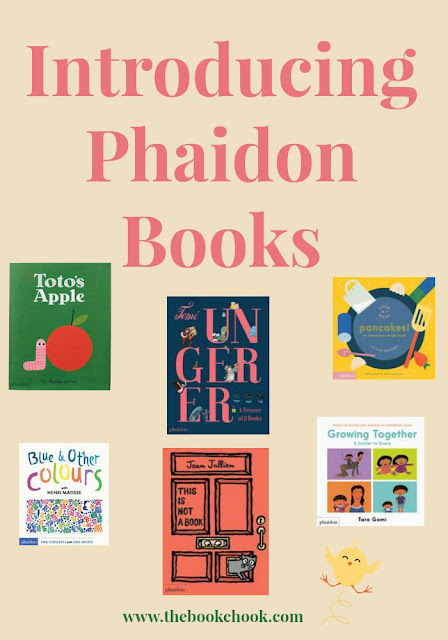 If you’d like the opportunity to introduce your kids to top-notch art and graphic design from around the world, do take a look at Phaidon. While I adore many many books published in Australia, I love that we can expose our kids to different viewpoints and styles by finding books from other countries too. With its emphasis on visual arts from all over the world, and books of undoubtable physical quality, Phaidon is worthy of your earnest consideration. This is Not a Book by Jean Jullien, published by Phaidon (2016.) RRP: $Au14.95. A playfully deceptive format that encourages young readers to see things differently. It can be difficult to find board books that are different to the run of the mill single image and single word to a page. Here's a beautifully made board book for kids 2+ that encourages youngsters to ponder, play and have fun. There's even a section at the end that folds out to make a house. I can see this wordless picture book becoming part of imaginary play with toys, and love that children will thus learn to associate books with enjoyment. NB: The Book Chook will be taking a break now until later in January 2017.